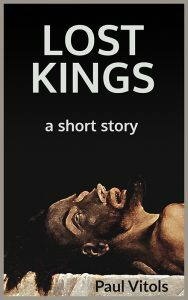 In Lost Kings we pick up the thread of John Pulkis, last seen at age sixteen in The Thought Dial. Now he’s twenty and facing a conflict that is not romantic but vocational and spiritual. Without exactly being able to articulate it, he’s in search of meaning. His adult life stretches before him; how should he spend it? Is there an organizing principle around which he can order it? What might he be willing to devote his life to? These questions roil under the surface when John arrives at a crucial decision point with his friend and traveling companion Stephen. And John is alarmed to discover that even though he is young and free in Europe, with a van of his own, he is only a hair’s breadth from despair. Set in 1979, Lost Kings recalls a time when the world was a bigger place. There was no Internet; there were no mobile phones; and international calls, though available, were expensive. You lived for the letters that you hoped were waiting for you at the next major post office. Traveling abroad, you really were far from home and faced an unfamiliar world on your own. It’s difficult to experience that kind of solitude today, but you can taste it when you join John and Stephen on their European adventure. When I first drafted the story in 1993, I had an idea that I would write a series of short stories featuring John Pulkis—rather as Ernest Hemingway wrote his Nick Adams stories (although I hadn’t yet heard of Nick Adams). But other things got in the way and only two stories, The Thought Dial and Lost Kings, have seen the light of day. As with The Thought Dial, Lost Kings is based on actual events, altered, augmented, and recombined to create a new story. I’m hoping that it conveys some of the power and urgency of that time and place. So climb aboard the boys’ VW Westfalia, settle yourself on the bench seat behind them, and get ready for myth, magic, and the wintry beauty of the Italian countryside, where John Pulkis is about to face the next turning point in his life.